We’d love your help. Let us know what’s wrong with this preview of The Journey Toward Reconciliation by John Paul Lederach. To ask other readers questions about The Journey Toward Reconciliation, please sign up. No I just wish to Read Lederach's all books would you pls help me get the copy of them? 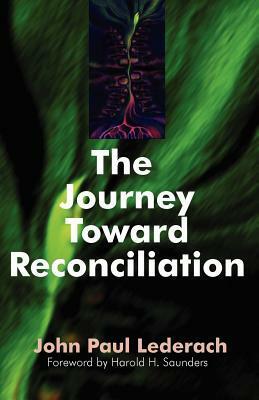 I found The Journey Toward Reconciliation hard to put down. I don't feel that way all to often about a book. Maybe I'd say it about Terry Pratchett or Patrick Rothfuss, things fantasy and sci-fi, but not often a book about peacemaking. But I wanted to keep reading and reading JTR. Lederach subdivides JTR into three parts. Part one draws on Lederach's work in international peacebuilding. Some of these anecdotes read with the intensity of a spy novel yet deeply tragic and real. Alongside these narr I found The Journey Toward Reconciliation hard to put down. I don't feel that way all to often about a book. Maybe I'd say it about Terry Pratchett or Patrick Rothfuss, things fantasy and sci-fi, but not often a book about peacemaking. But I wanted to keep reading and reading JTR. Lederach subdivides JTR into three parts. Part one draws on Lederach's work in international peacebuilding. Some of these anecdotes read with the intensity of a spy novel yet deeply tragic and real. Alongside these narratives Lederach places reflections on a biblical theology of conflict. I found this extremely useful. Part two applies this to congregational conflict--particularly Mennonite congregational conflict. This hit very close to home for me, a Mennonite pastor. Honestly, while this part was quite near to my experience, it was perhaps the slowest part of JTR for me. Part three, without ever naming it as such, turns to something like spirituality or the spiritual practices of a peacebuilder. When I read this, I needed it. This is such a well-intentioned book, and reconciliation is such a powerful idea, that I was prepared to embrace any insight it may offer even though I'm not a Mennonite. Unfortunately, I was really left with the impression that this book is for Mennonites only (other radical pacifists might not resonate with the insider lingo). My biggest complaint is that the book needed stronger editing. Even students of theology need a better context for abstract ideas which vary widely based on the translat This is such a well-intentioned book, and reconciliation is such a powerful idea, that I was prepared to embrace any insight it may offer even though I'm not a Mennonite. Unfortunately, I was really left with the impression that this book is for Mennonites only (other radical pacifists might not resonate with the insider lingo). I liked the theme of reconciliation being a journey in this books and the discussion of the various methods that can be used to make this journey. Lederach has very easy to read, almost conversational style - which definitely helped. So often I've found that the texts I have to read for my course are an awful slog. This is far from that. Peppered throughout are stories - from Lederach's personal experience, from the Bible or ones that have been told to him. This offered a nice break from the more I liked the theme of reconciliation being a journey in this books and the discussion of the various methods that can be used to make this journey. Lederach has very easy to read, almost conversational style - which definitely helped. So often I've found that the texts I have to read for my course are an awful slog. This is far from that. Excellent, honest, practical, and inspiring. Why did I wait so long to read this? Chapters 4 ("The Meeting Place" of Truth, Mercy, Justice, and Peace) and 13 ("Wander, Wonder, and Wait") were particularly meaningful to me. “We commit ourselves to the journey toward reconciliation because we believe it is right-even when we are not sure, as John Paul says, how it will progress or end. We believe that walking down the path to peace offers a way better than violence and an instrument more powerful than force to conduct the affairs of humankind. We pray that others will join us.